The neighborhood of Tianzifang (田子坊), located deep in the heart of the former French Concession, was built in the 1930s and is outlined with shikumen (石库门) complexes – a traditional style of Shanghai architecture that combines Western and Chinese characteristics. While Tianzifang was formerly a residential neighborhood, it has recently followed the footsteps of its big brother Xiantiandi (新天地) to become more commercialized. But while Xiantiandi has conformed with New China by showcasing overpriced trendy restaurants, cafes and designer boutique shops, Tianzifang has held on to its rustic roots to remain authentic... for the most part. Certainly, Tianzifang has modernized to become a popular tourist destination, so you’ll definitely find your fair share of eateries and coffee houses, but when you visit you’ll see that it does indeed still have a unique charm. Apart from snapping shots of Tianzifang’s traditional shikumen facades, also be sure to 1) indulge in some of our favorite places to eat and drink 2) shop for a few kitsch souvenirs and 3) scope out some cool art galleries. Coincidentally, NY Burger is my favorite burger in all of Shanghai. But don’t just take my word for it, even City Weekend rated NY Burger as the city’s best out of 32 competitors. But be careful, NY’s burgers are massive! Ditto for the high quality imported steaks, so definitely come hungry. I recommend the Monster since it basically has just about everything you’d ever want in a burger smashed between two buns (and because I’m obviously a glutton). Be sure to sit out on the terrace on a nice day to check out some of that good Tianzifang architecture we were talking about. With a fairly standard regional Indian menu – think garlic nan, tandoori chicken, spicy curry, King Fisher beer, and basmati rice dishes – Lotus Land is as straight forward as they come. However, that’s not necessarily a bad thing, especially when you need a change from xiaolongbao. The interior design is also cool and spacious, giving you the option to sit at a table or on the floor with padded cushions. With all that being said and the lack of good Indian food in Shanghai, Lotus Land is definitely worth checking out. Amazing Grace, owned by chef Grace, specializes in Singaporean/Malaysian dishes. I visited this place not long ago with my Malaysian friend to rate its authenticity, and she stated that “the beef rending was glorious.” For my nonnative palate, I thought it was excellent and personally enjoyed the char koay teow and chicken satays. It also had a nifty set up inside with traditional music, décor, pictures of Grace’s achievements and an open-windowed SE Asian styled interior. 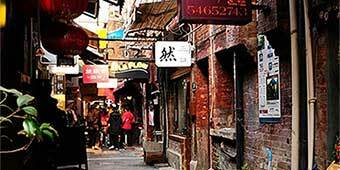 A cool hangout in the apex of Tianzifang with a communist realist touch, Kommune is quite the popular destination. Breakfast, lunch and dinner are all served here: for the morning try some of their home brewed coffee with a bagel, for lunch grab a wrap or salad and for dinner pick up a burger and beer. It’s also worth mentioning that they have special events going on throughout the week, so check out their website to see what catches your eye. This old, dusty, wooden tavern tucked deep inside the alleys of Tianzifang is an awesome place for a cheeky cocktail with friends and/or to curl up with a book alone with a glass of red wine. They have an extensive wine list, better than average cocktails, hookah pipes, a good selection of imported beers and even a book exchange. As with Kommmune, be sure to surf their website to see which special events are happening. Shopping in Tianzifang is fairly standard; you’ll find the cheap “Made in China” souvenirs that you can find at just about any other tourist attraction in the Middle Kingdom lining the winding alleys. Oba Mao T-shirts, paper cut outs, ink stamps, portraits of Mao Zedong and the “glorious” revolution, chopstick sets, your name scribbled in Chinese characters, and anything else that you can bring your friends and family back home to prove you actually went to China can be found here. To be fair, some of these trinkets are cool, so while here you may want to pick up a few and kill two birds with one stone. Note: bargain hard!!! Even though Shanghai doesn’t even come close to competing with Beijing in regards to art, there are still a few galleries in Tianzifang that might be worth popping in for a minute. Again, like shopping, a lot is the reproduced factory manufactured prints that are found all over China, but not all. There are a few foreign and local owned galleries, and most sell their work, so pop in to see what’s on display. Perhaps the most popular studio is Cheng Yifei’s, a famous Chinese realist artists, located on Taikang Lu Lane 210 (田子坊泰康路210弄). are the turds on the street special, too?